With over 600,000 acres, Anza-Borrego Desert State Park includes washes, wildflowers, palm groves, cacti and sweeping vistas of the Colorado Desert. 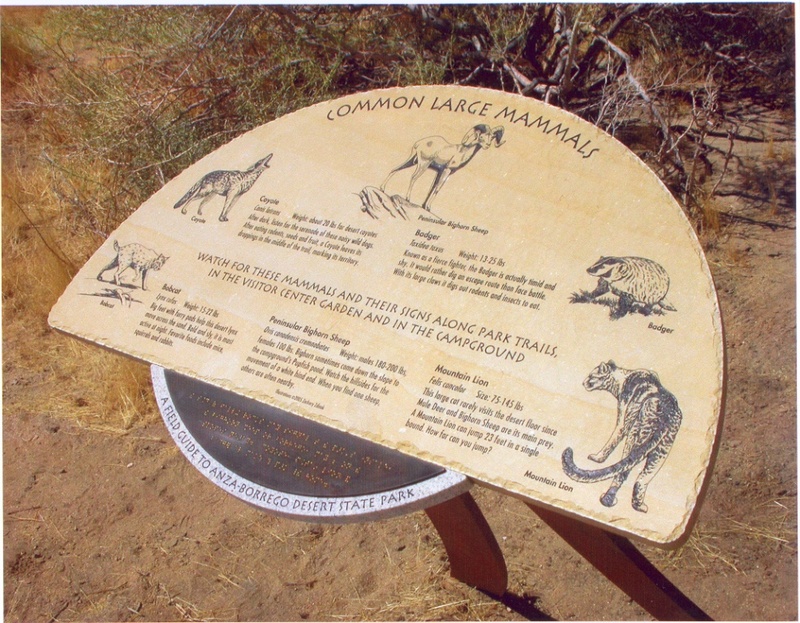 The park office, visitor center, and three of its campgrounds have many accessible features described below. Phone (760) 767-5311. Many visitors approach from the east or west via Highways S22 and 78. Highway S2 enters the park from the south off Interstate 8. 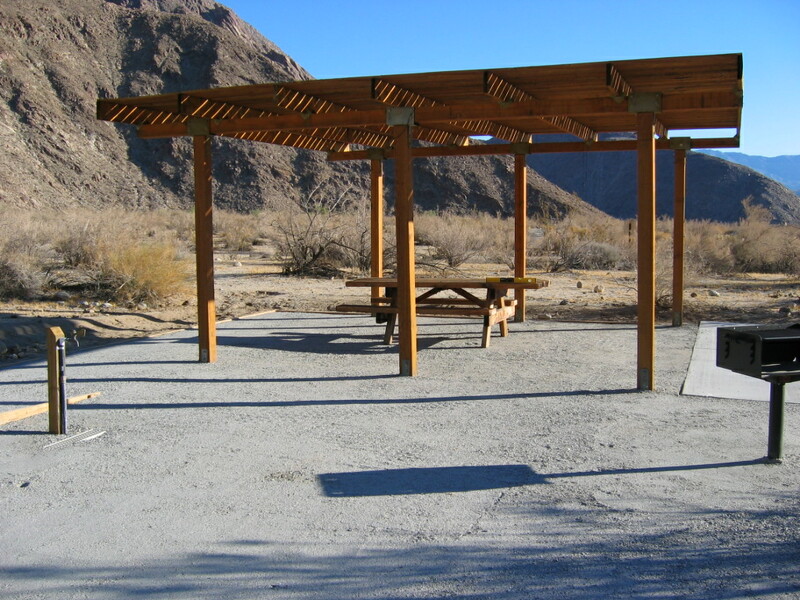 Borrego Palm Canyon Campground: In the developed sites, 3 tent campsites are accessible. All are accessibly furnished and located. The tent pads are 12 foot x 12 foot on soft sand. Two RV sites with full hookups are accessible. The campfire center has been made accessible. Restrooms: Five accessible unisex toilet rooms with separate showers are dispersed through the upper and lower ends of the campground with some near tent sites and some near sites with RV hookups. Routes of travel: pathways from sites to restrooms are accessible. Parking: There is one accessible parking space adjacent to each of the accessible restrooms. 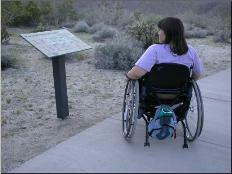 Tamarisk Grove Campground: Three campsites are accessible. Restroom: An accessible restroom and shower building is adjacent to one of the accessible campsites. Parking: An accessible parking space is adjacent to the restroom building. Bow Willow Campground: There are 2 accessible campsites and an accessible non-flush restroom at this remote primitive campground. Horse Campground: There is 1 accessible campsite and an accessible horse mounting ramp at this campground. An accessible restroom is available. Routes of travel to the restroom and campsite are accessible. 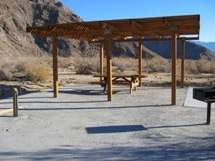 The 0.75 mile All-Access Trail near the Visitor Center has been improved and now connects the Visitor Center to the Borrego Palms Campground. Interpretive panels focus on area plants and animals and include Braille text keyed to alternate senses. The Culp Valley Trail is a 0.5 mile accessible trail that starts at the Culp Valley Campground located off S22, Montezuma Valley Road. Access to the trailhead is located on the backside of the campground. Accessible parking is available at the trailhead and the accessible restroom at the campground. This trail is constructed of compacted soil and gravel and has a destination overlook of the Borrego Valley and surrounding area. The Visitor Center is generally accessible and includes automatic doors at the entry. Exhibits are generally accessible. Assistive listening devices are available. Exterior accessible restrooms off the parking area are available. Parking includes four designated accessible spaces with one van accessible. The path from the parking lot to the Visitor Center entry is 300-feet-long, but the path is paved and generally accessible.